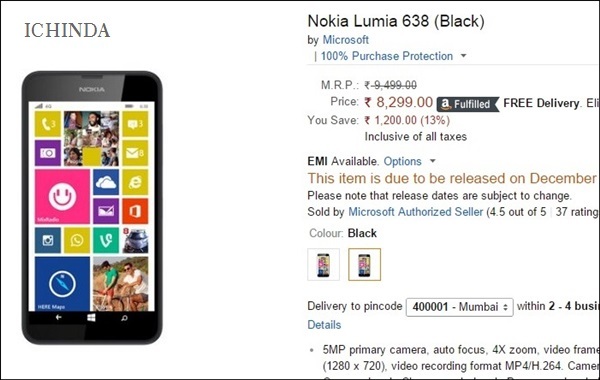 Microsoft Lumia 638, Cheapest 4G LTE smartphone finally launhced in India priced at priced at Rs 8,299 in Orange, Black, Yellow, White colour option. Now up for pre-order through Amazon from Wednesday 18th Dec. 2014 Rs8,299 in Black colour option with Airtel users get free 5GB 4G Data per month for 2 months(Available only on special 4G Postpaid SIM in Bengaluru). It will take on Xiaomi Redmi Note 4G. The all new Microsoft Lumia 638 supports Cat. 4 LTE, Wi-Fi, GPS and Bluetooth comes with a 4.5-inch FWVGA ClearBlack LCD display with resolution (480×854 pixels) and Gorilla Glass 3 and a pixel density of 221ppi offers you crystal clear view from every angle perfect for watching movies, video and playing games. It also runs on Windows Phone 8.1 with Lumia Denim update and powered by a 1.2GHz quad-coreQualcomm Snapdragon 400 SoC which allows your apps smoothly and makes multi-tasking a fun while 1GB RAM, 8-GB internal memory and 128GB expandable memory and Free 15GB of Cloud Storage, available on OneDrive which is enough to store your favorite songs, movies, games and apps. Microsoft Lumia 638 sporting a 5-MP rear camera auto focus, 4X zoom, video frame rate 30 fps, video resolution 720p (1280 x 720), video recording format MP4/H.264 with Camera Apps: Bing vision, Lumia Camera, Lumia Cinemagraph, Lumia Panorama, Lumia Refocus, Lumia Selfie for shooting but no front camera the biggest draw back in it. It’s packed with 1830mAh battery measures 129.50 x 66.70 x 9.20 and weight is 136 gm inclduing accessories like Nokia stereo headset WH-108, Nokia portable wireless speaker and Nokia universal portable USB charger, DC-19. Rear Camera 5MP, auto focus, 4X zoom, video frame rate 30 fps, video resolution 720p (1280 x 720), video recording format MP4/H.264. Nokia universal portable USB charger, DC-19. At last few honest word, the all new Microsoft Lumia 638 is coming to change your life with it’s unbeatble speed. What you think? Please be open to give your view.